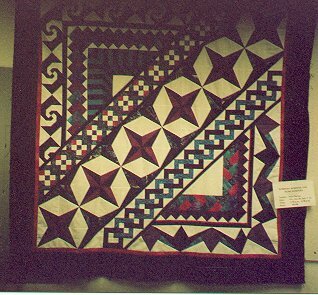 Generally speaking, the main point of interest in a quilt is what's in the center .. the main pattern, so to speak. That's what initially catches your eye. But the quilt top needs to be finished somehow and many times adding borders is what sets off a superlative quilt from a simply well-done one. So, that's another facet that needs a decision: what kind of border? how many? There are so many to choose from. And while there are classes that can be taken on sampler quilt blocks, you only get one decorative border per quilt. Until .... summer of 1994. My local quilt shop offered a class on a quilt top that was made up entirely of border patterns! This was exactly the kind of class that is lacking from shops' repertoire. The blurb from the instructor's packet reads, "Welcome to a new type of adventure. Now that your quilt top is complete and you are trying to decide on what to do to your borders, I hope this class will be of some help. We will be working on 9 different borders, but will be discussing many, many more. 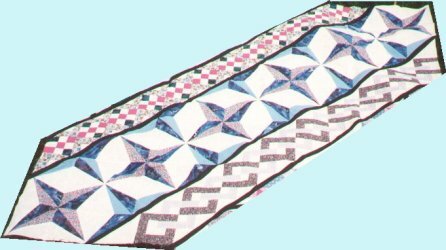 I hope that you will come away from the class with a new understanding on how to arive at the "just right" border for your quilt. The class will be divided into 3 sessions. The firstst week we will discuss borders in general and how to break them down into simple blocks. [We sewed one section as homework each week.] The second week, we will work on upper left corner section and the third week will be the lower right corner section." Unfortunately, I don't have fabric samples at this time for a close-up inspection. It took me forever to delve into my stash and pull all the fabrics that would work well together and at the present time, my fabric stash is somewhat unavailable (we are in the process of remodeling so that I get a newer, bigger sewing/craft room and an honest-to-goodness business office. As a result, my fabric stash is ..well.. stashed all over the house). 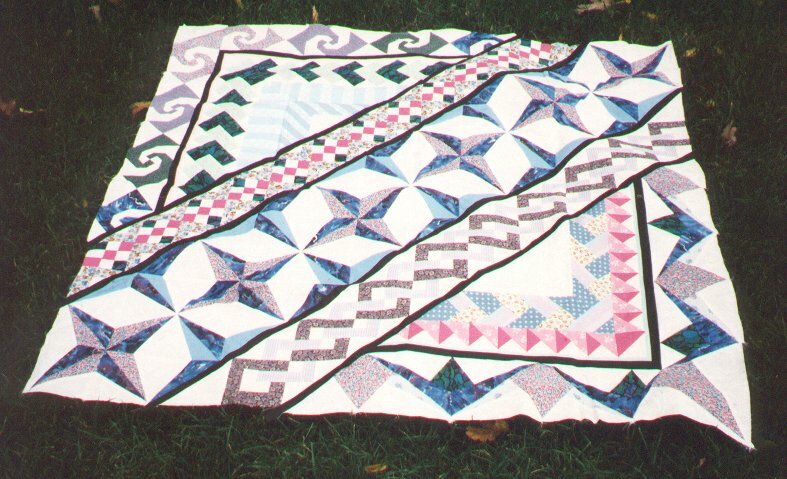 The quilt is divided into 3 sections; within each section were 3 border patterns. The background fabric for the entire quilt is an off-white fabric with white marbling. Outer border: Snail's Trail: this was the first time I used paper-piecing as a basis for making a quilt block. I was just amazed at how incredibly accurate you can get with this method. Point are never clipped (which has always been a problem with a lot of my blocks). The snails are done in a dark green with a white, small overall design and a medium lavendar, also with a white, small overall design. Middle border: Card Tricks: this was constructed in a manner similar to Seminole patchwork (another technique that I had done before and just adore). The fabrics used were a dark green/purple marbled fabric and a white fabric with a light green, small overall design. Inner border: Shading Stripes: for whatever reason, the instructor's result looked a whole lot better than mine! The intent was to produce a border that looked like a 3D stripe ... and mine didn't come out too well. But it was an interesting assignment to have to match vertical stripes with diagonal stripes. The fabrics used were a blue background with white polka-dots and a coordinating solid. I haven't a CLUE why I ever had a polka-dot fabric around .. I detest polka-dots! Upper diagonal border: 9-Patch blocks: I discovered, after I had initally made this border that you absolutely need highly contrasting colors. Unfortunately, my first attempt didn't and the 9 patch in the middle was totally washed out when coordinated with the print outer edges. I was disgusted because I knew I couldn't leave it like that. The entire 9 patch section was recut, resewn and then the floral print outer edges sewn on. Essentially, I made this border twice. 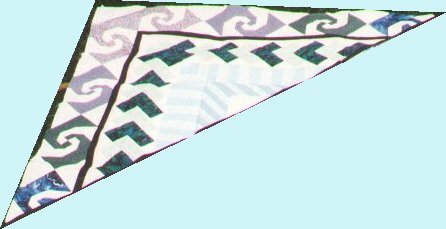 The final 9 patch was done in the dark green/purple marbled fabric of Card Tricks, a hot pink and a blue/beige floral print. 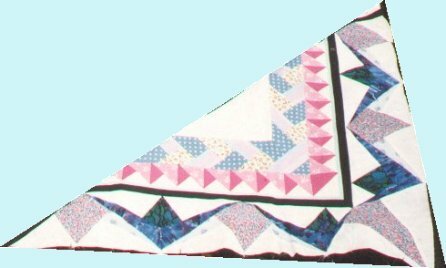 Middle diagonal border: Stars: at first glance, this border looks as though it is made of a 4 pointed star with contrasting points on the outer edges. But upon closer inspection, you will see that the blue points that appear to separate the dominant stars are really the same star, made from a different color combination and simply cut in half. The colors used in the main stars are a dark blue/purple with gold metallic "lightning and stars" and a pink/blue/purple floral mini-print. The outer half-stars are made from the same dark blue/purple and metallic fabric as the first star but now paired with a medium solid blue. Lower diagonal border: Chain Links: this border looks like interlocking square links. The fabrics used are a dark purple floral mini-print and a medium lavendar and white stripe. Inner border: Braid: now with the proper coordination of fabrics and the proper distance for viewing, this border actually does look like braided fabric. My selection was less than splendiferous and while, yes, it does kinda/sorta look like a braid, now that you mention it, I could have picked a better selection. The fabrics used were a light green/brown floral mini-print, a medium blue w/ small white flower buds and a pink/lavendar varigated stripe. Middle border: Pyramids: knowing that this was supposed to be a pyramid (with the dark color being the shadowed side) goes a long way in helping you figure out what the heck this was to be. :-) The fabrics used here were a medium pink floral and a coordinating hot pink solid. Outer border: Points: this was the instructor's favorite because it was computer-generated. She had just purchased a quilting software and was playing around with it to see what it could produce. She liked this design so much, she included it in the border sampler. The fabrics used are the same dark green/purple marbled fabric as previously described, the same dark blue/purple with gold metallic as previously described, the same pink/blue/purple mini-floral as previously described and a newly introduced light blue mini-floral. So, what exactly is there left to be done? Two outer borders. The first narrow border serves to "stop" the eye from travelling. The *main* reason it hasn't sewn on is there are problems with inadequate seam allowances on some of the blocks already assembled, producing blocks that aren't aligned correctly on their outer edges. I was annoyed when I discovered that and I wasn't exactly sure how to compensate for it. I put the entire project aside.